Do you normally have an early dinner? Do you go to sleep early at night? If answers to the above are in the affirmative, then you are on the right track. Please know that if you eat late dinner or go to sleep late at night, you create problem of illhealth for yourself. Have early dinner at 7.00 p.m., latest 8.00 p.m, to enable the food digest properly before you go to bed. Early dinner also creates room for you to empty your bladder sufficiently, so that you can sleep soundly throughout the night. When you go to bed late at night, you are tired and sluggish the following day. Even minimal sleep loss affects your mental alertness, your mood, energy, ability to handle stress, and even increases your risk of high blood pressure, depression, heart disease, etc. 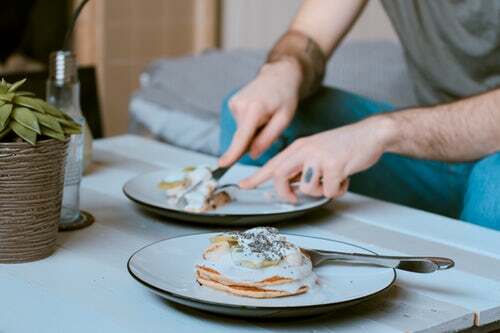 I wish to caution that you should not miss breakfast, because having adequate breakfast, tends to reduce cravings and gives you a sense of control, so that it becomes easier to eat more moderately later in the day. 1. Obesity – Towards the end of the day, the body process and metabolism slows down. Therefore when you eat late dinner, such food can not be utilized for energy. Rather, it is converted to fat stores, causing weight gain. Also if you develop the habit of eating ravenously in the evenings; first snacks, later dinner, and much later, you munch, munch, and munch away snacks as you listen to the news, watch soccer, movies, etc., you will develop serious weight problem. There is no running away from it. 2. Poor Sleep – The Sleep cycle is seriously affected when you have late dinner, and this also causes poor digestion. 3. Gastrointestinal Problem – When you eat late, you experience digestive problems such as bloating, heart burn, acidity, uneasiness. But having an early dinner helps your digestive system process the food early before you go to bed. 4. Energy – An early dinner helps your brain and other organs of the body re-energize themselves for the next day’s activities. You are more refreshed the following day because your body’s system work the way it is programmed, and so you hardly feel lethargic and tired the following day. 5. Healthy Heart – When your food is properly digested in the right way, and timely, it helps your heart to beat normally, making it strong and healthy. 6. No Stomach Ailments – You do not experience stomach ailments, and it also improves your bowel movement, since you gave your body sufficient time to digest the food before going to bed. However, if situations force you to occasionally have late dinners, eat very light dinner, e.g. sandwich, potato chips or fried plantain, salad, etc., 2 hours before going to sleep, and avoid drinking plenty fluid. Please form the habit of drinking Tiens Antilipemic Tea, 15 minutes before breakfast, and 15 minutes after dinner. It will help with digestion, boost your immune system and help you maintain perfect health in the body. If you wish to purchase Tiens Antilipemic Tea or any other Supplement, please feel free to text or call me on +2348034863154 or +2348097890448 or send a mail to lynmail45@gmail.com, and I will promptly attend to you. Tiens Antilipemic Tea Which Also Contains Green Tea is a Natural Health Product and Builds The Immune System As Well As Protect You From So Many Ailments.